Gryfft co-wrote this one too. When we stand together, we are funnier than we ever could be on our own. 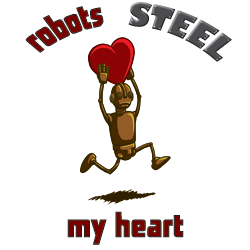 Preorders for the new Robots Steel My Heart shirt are open through April 1st! Place yours today! I copied and pasted this bit from the last comic. Gryfft co-wrote this one. Props to you, Gryfft! Preorders for the new Robots Steel My Heart shirt are open through April 1st! Place yours today! See you guys on Monday. In the meantime, buy this shirt! I’ve never seen Welcome to the N.H.K., but honestly it sounds like anime deconstructing its own fanbase. Tune in tomorrow for an extra-special comic concluding this stupid anime thread! Those of you who were hoping for a punchline in this comic may turn your attention to the second panel. You too can own Becky’s “Robots Steel My Heart” shirt! Purchase it now in the store! Becky’s “Robots Steel My Heart” shirt is now available in the store! Welcome to our series on the history and rise in popularity of anime. I hope you are as excited for it as I am. I wanted to have James use the word “post-shonen” in the last panel because it’s such a James word to use, but it’s not really accurate. Oh, and because I’m sure someone will either ask or comment about it: Beetamax. Check it out! 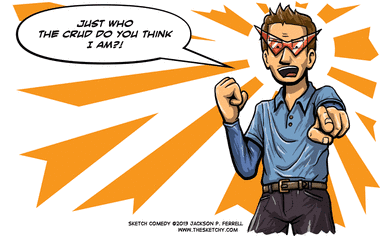 Sketch Comedy now has its own TVTropes page! Of course, the real Descartes would not have his worldview threatened in the least by the existence of a robot, nor would he entertain Aristotle’s view of souls for even a minute, but sometimes we must make sacrifices for the sake of the joke.